The need to calculate the values of angles in degreesAh arises not only in solving various tasks from school textbooks. Despite the fact that most of us the whole school TRIG seems to be completely detached from the life of abstraction, sometimes suddenly it turns out that at hand are no other ways to solve purely practical problems in addition to school formulas. The measurement in degrees of the angles applicable to the full. If it is possible to use the appropriate measuring device, select the one that best meets the task. For example, to determine the value of the angledrawn on paper or other similar material, quite suitable protractor, for determining the angular directions of the terrain have to look for the geodetic theodolite. 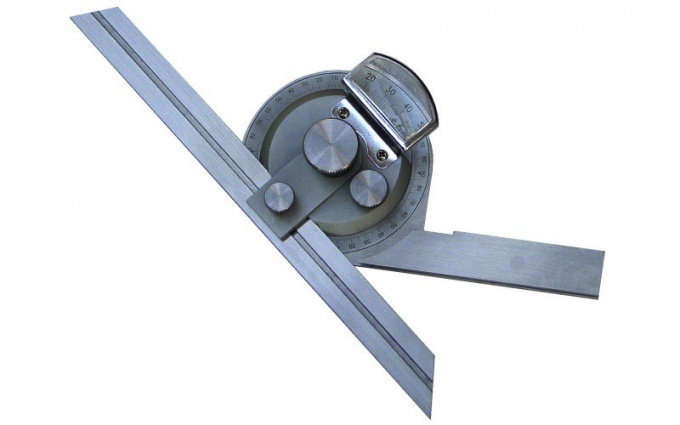 For measuring angles between adjacent planes of any volume of items or units of use protractors - there are many types, different device, method of measurement and accuracy. You can find more exotic instruments measure angles in degrees. If the possibility of measurement using the appropriate tool is missing, then use is known from school trigonometric relations between the lengths of sides and angle measures of the triangle. It will be enough possible to measure angular and linear dimensions - e.g., using rulers, tape measures, meter, pedometer, etc. With this start - measure from the top corner along two of its sides convenient distance, write down the values of these two sides of a triangle, and then measure the length of the third side (the distance between the endings of those parties). Select to calculate the value of the angle in degrees of one of the trigonometric functions. For example, you can use the theorem of cosines: the square of the length of the side lying opposite the measured angleequal to the sum of the squares of the other two sides minus twice the product of the lengths of these sides into the cosine of the desired angle (a2 = b2+c2-2*b*c*cos(α)). From this theorem, print the value of cosine: cos(α) = (b2+c2-a2)/(2*b*c). Trigonometric function, which restores the value of the cosine of the angle in degrees, called the arc cosine, this means that the formula in its final form should look like this: α = arccos((b2+c2-a2)/(2*b*c)). Substitute the measured dimensions of the sides of the triangle obtained in the previous step, the formula and perform the calculation. This can be done using any calculator, including those that offer various online services on the Internet.